Trump's full quote: Oh, I get it! I am a very good developer, happily living my life, when I see our Country going in the wrong direction (to put it mildly). Against all odds, I decide to run for President & continue to run my business-very legal & very cool. End quote. I don't know what bothers me the most. His constant need to capitalize the word "country" or his phrasing of Very Legal and Very Cool. Not just regular cool. Not just "it's chill". Nope. Very cool. Anyway, you can get it on a red cap. We used an ampersand in the cooper font and we love it. 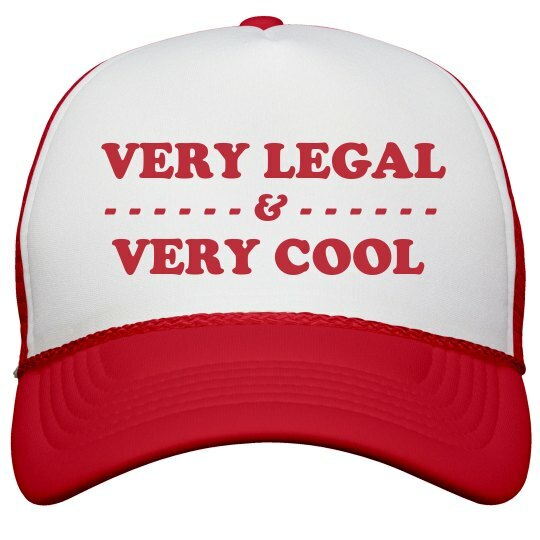 Red trucker hats with white front panels are also very cool.